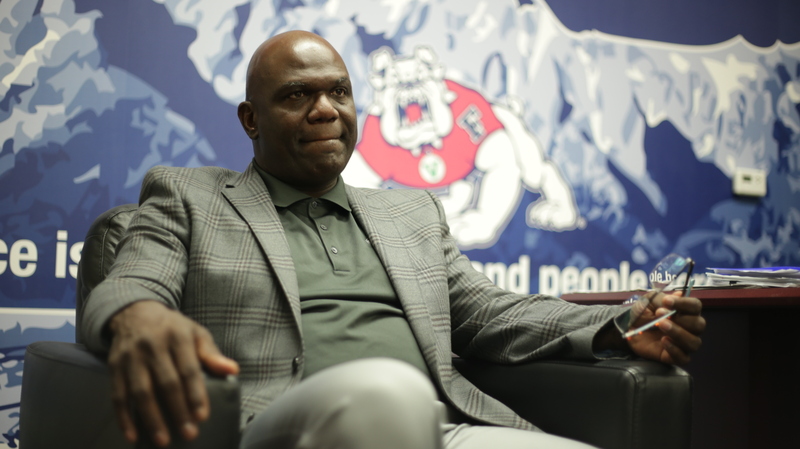 Bulldog AD’s Bold Ideas: He Talks Football, Facilities, and Education. 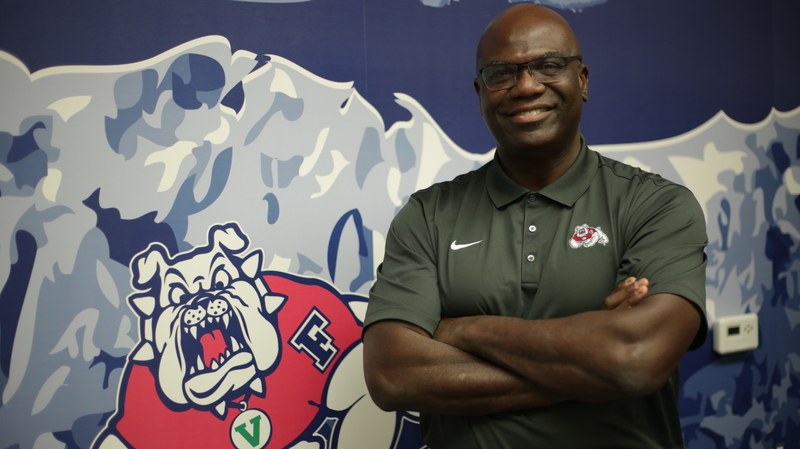 Nearly four months into his new job, Terry Tumey continues settling into his Fresno State office. 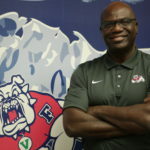 Fresno State hired Tumey in June as its athletic director, replacing Jim Bartko. He officially assumed his duties in August. Memorabilia from his life as a player and working his way up the sports administration ladder adorns Tumey’s office. 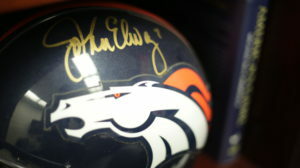 A signed John Elway helmet from his first professional football job — an internship with the Denver Broncos — sits on a shelf facing his desk. Below that, a book by Hall of Fame coach Bill Walsh is next to a 49ers helmet he signed. That’s a holdover from Tumey’s time as an administrator with San Francisco. Naturally, a picture of Tumey with his wife, Candace, and daughters Simone and Cameron have a prominent place on another shelf. He proudly shows off a baseball bat acquired as a player at UCLA. The black and white painted hunk of wood honors Jackie Robinson, a Bruin great before breaking baseball’s color line. 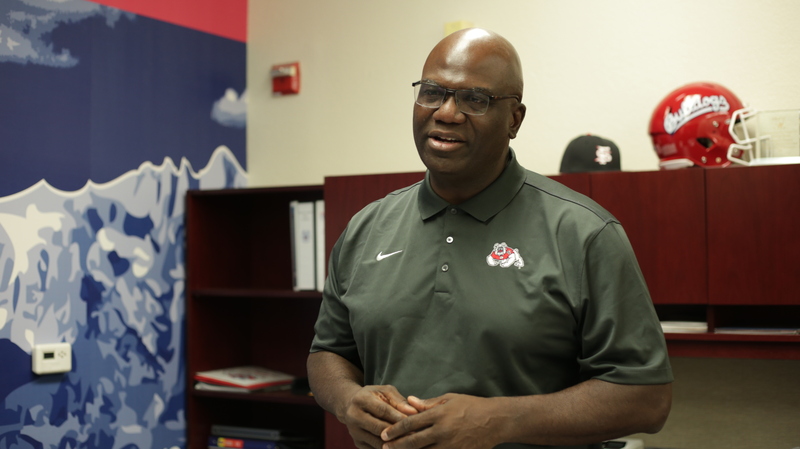 Tumey is on a quick learning curve about the Red Wave, as well as the Fresno community. He’s inherited a quality football team, but that isn’t necessarily translating to full houses at aging Bulldog Stadium. 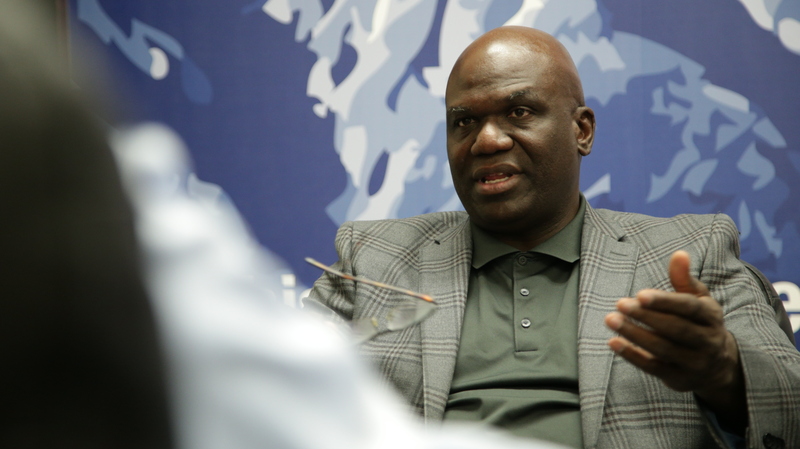 Tumey recently sat down with GV Wire for a comprehensive interview on his vision for Fresno State. GV Wire: Let’s talk about Bulldog Stadium. Tumey: Everybody likes to (talk about it). Even though it’s older, I will tell you, the bones of this place in terms of what it provides are really wonderful. I’ve been to a lot of different stadiums and every seat is a great seat of Bulldog Stadium. Anything that we can do to make the fans’ experience on game day more enjoyable is a plus. Whether it is making it easier to navigate, improving our concessions and our bathrooms, and things of that nature, are always going to be seen as positives. I think the Wi-Fi piece would be huge because that’s kind of where our community is right now. Making that fan experience more enjoyable and making it to where they’re really engaging — there’s no better marketing tool than a fan who’s doing a selfie while they’re at the stadium. That means they’ve bought in and are personally invested in the experience. We want to be able to enhance that. GV Wire: What’s your relationship like with football Coach Jeff Tedford? Tumey: Jeff’s wonderful. I feel as though I am blessed with one of the top coaches in the country. It was proven last year. He was one of the top five coaches. But more importantly, I’m more impressed with how Coach Telford cares for not only the success of his football players — his student-athletes — but also other student-athletes. When you have a head football coach that does amazing investment in his sport that’s one thing. But when he also goes out of his way and supports say our swimming program or supports our other sports — that’s the key and I feel like I have a very special person in Jeff Tedford. GV Wire: Are you worried he may leave for another program? 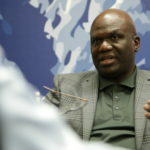 Tumey: You’re always going to worry about coaches being attracted and possibly going to other places. If you’re supporting our coach in the right way, literally you shouldn’t be that worried, because they know that at the end of the day, you care about their success and that’s very important. We do that quite well here at Fresno State. I will also say that if a coach has done a very good job here and has made you successful, we as an athletic department should be thankful for the contributions of that coach, even if they are going to depart because they’ve made our student experience better and that and that’s what’s most important here. But I feel as though here at Fresno State, if you’re a coach here, we’re supporting you and looking for you to stay here a long time because we feel like this is a great place. GV Wire: What is Fresno State’s place in the NCAA and college football landscape? Tumey: The paradigm of collegiate athletics is changing right now. 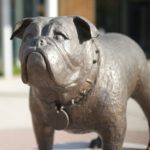 It’s going to be important that Fresno State carves out its own niches to where it believes it should be within the landscape of collegiate athletics. Do I see Fresno State or the Mountain West ever becoming a Power Six? I’m not sure if all of our partners, all of our membership, would ever want to be in that space. Do I ever see Fresno State possibly moving forward joining another conference? I think we’ll always be open to those opportunities as they arise. But right now, I think what’s most important is that we invest in ourselves to make ourselves the best institution we can be. GV Wire: Should student-athletes be paid? Tumey: I do feel as though student-athletes should garner the same benefits that any other student should have at an institution in terms of their support and their well-being. We as an institution are charged with supporting or providing a great experience for them. That’s what our athletic department should do. I’m very much in favor of our movements that we’ve made in the cost of attendance and things of that nature. I’m also in favor of enhancing their ability to be successful once they matriculate through this institution. But I’m also very much protective of what it means to be an amateur and what those principles are all about. The question that you’re asking is a very difficult one. It’s how do we support the student-athlete experience and make sure that there is a real distinction from being a professional athlete and that of a student-athlete. That’s the real question that we’re coming into play with right now. GV Wire: What will it take to get Fresno State to that next level? Tumey: If we’re going to make the claim that we want to enhance the student experience, one of the bigger pieces of the puzzle is going to be how we address our facilities issue as it relates to not only football, but also to the student-athlete experience as a whole. The training table is a very valuable aspect of that — how we make sure that all of the nutritional elements of all of our student-athletes are addressed. GV Wire: How do you finance the needed improvements? Tumey: We’re going to be looking for the community to help us do that. There are people who believe in what Fresno State is doing and are very proud supporters. We have an amazing community here, and I will be looking for those partners to help us as we move forward. When it comes to fundraising, there are not a ton of institutions that have one person who writes a check. Whether it’s a T. Boone Pickens at Oklahoma State or John Arrillaga at Stanford … but those are kind of different and could somewhat be anomalies. Most the time, believe or not, it is a collaboration of a lot of vested individuals who could help you build. And there’s been success throughout this nation of individuals who can do that. We’ll be in that mix. I will also say we are in one of the most fruitful places in terms of people who can invest. The Valley and its farming community feed the world. We have some amazingly resourceful people here that can help us take it to the next level. I’m a new leader here. They need to get to know me and quite honestly I need to prove to those individuals that we are moving in the direction that would cause them or want them to invest. I think we’re doing that … and they believe in what we’re doing as a department. GV Wire: Who are some of the top people you talked to while getting acclimated to Fresno State? Tumey: It’s going to start with our president. Our president has a vision for this institution. President Castro, as a first generation (college graduate) himself, really values what academics can do to change the trajectory of a person’s life. So it’s got to start with him. He’s the person that truly has set the ship forward for us and has moved us in a way that has been fruitful in trying to serve all aspects of our community. Tumey: I’ve had great interactions with Kevin Sweeney, who I think is an awesome, amazing person. I’ve had great interactions with Pat Hill. He has been awesome to work with. GV Wire: How would evaluate the spirit of the Red Wave? Tumey: Right now, we’re experiencing Red Wave 2.0 to where we have this core group of folks who are amazingly spirited for Fresno State. Those people are still there and we love them and we see them as phenomenal. We’re starting to now generate this new version of the Red Wave where there’s going to be more even more people in different groups. A lot of diversity in our community is all starting to kind of show up at our stadium. I don’t see the lack of attendance. If you look at our numbers on a game-to-game basis from last year to this year, every one of our numbers are up. There’s incremental growth that is happening. Note: Average football attendance through four home games is up 767 fans over the first four games last year. I don’t see that there is a negative towards what the Red Wave is. I think we’re growing and building. We’re not a finished product. We’re not there yet. I think the proof is going to be in the pudding five or six years from now with continued success academically and athletically. … The Red Wave is coming back, and it’s coming back strong. “We’re experiencing Red Wave 2.0 to where we have this core group of folks who are amazingly spirited for Fresno State. Those people are still there and we love them and we see them as phenomenal.”—Tumey on drawing new fans. GV Wire: How do you reach out to fans to bring them back to Bulldog Stadium and the Save Mart Center? Tumey: Fresno is the kind of place that really appreciates personal investment and the relationships to go along with that. Having our athletic department, our student-athletes, and our coaches go out into the community and sing the praises of what we’re all about and what we’re doing — that’s going to get people to start resonating and really becoming a part of it. Just like we want the community to invest in what we do, we as an athletic entity need to invest in our community. That’s really going to start to pay dividends. But like anything else, it takes work and time in order to get to the finished product of where you want to be. GV Wire: You’ve made personnel changes. Senior officials Paul Ladwig and John Kriebs are out. Meredith Jenkins is in. Tumey: What we’re trying to do is provide excellence here at our institution and trying to find individuals that will help us get there. We’ve had some amazing success with prior folks here, prior administrations here. 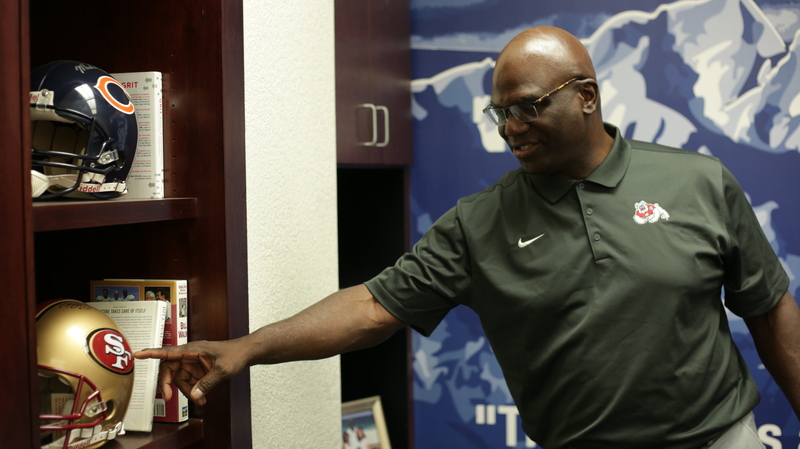 Fresno State was here a long time before Terry Tumey got here and has done quite well. But just like everything else, there’s always going to be new opportunities and new movement. We’re always just looking to try to move towards a standard of excellence that is truly important to us. I don’t ever really need to talk about personnel issues because I don’t really feel like that’s really the question. The question is, what are we trying to do to make sure this student-athlete experience is a fruitful one? GV Wire: How has adjusting to Fresno been? Terry Tumey: Fresno is what I would consider probably one of my best and most amazing stops. I don’t know if I’ve ever been at a place where people are more authentic and really, truly care about the institution, the students that we have, and our student-athletes. I feel blessed to be here. It’s a very humbling experience. 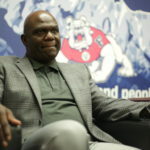 Tumey knew of Fresno State’s reputation from the Bulldogs he played against, worked with, or coached. Men like Jethro Franklin and Kelly Skipper formed his appreciation. But there was one quarterback who cemented Tumey’s appreciation for the Bulldogs. Tumey: These are people who have tremendous integrity and they have great character. That was my initial impressions of Fresno State. That got solidified with Trent Dilfer, being able to work with him when I was at the 49ers. And since I’ve gotten here, I’ve found out it’s much more than just the athletic aspect of the institution that really is stellar. I think it’s remarkable in terms of how we truly look to serve our community — much more than I would say many other institutions that I’ve been at it. Not only are we basically educating young people and trying to help them develop, but we’re also great community partners, which is really kind of fascinating. GV Wire: What are the biggest differences going from an athletic director at smaller schools (Dominican, UC Davis, Claremont-Mudd-Scripps) to Fresno State? Tumey: I think the ability to have what I would say is a closer relationship with your students because there’s less of them. When I say students, I mean the entire student body, not just your student-athletes. What I like to think I can do is to be able to replicate or take some of that intimacy, some of that personal investment that I had at the smaller places, and apply that to a much larger model here with a population of over 25,000 students. The same goals are in mind as it relates to serving these students and that is helping them have a transformational experience here. GV Wire: Talk about your background. Tumey: I grew up in Tulsa, Oklahoma. I have to be honest, it feels a lot like Fresno. It has the same values and roots of a kind of a Midwestern town which is what Fresno feels like, where people are valued. When a person says something, it means something to you. When a person shakes your hand, it’s a sign of friendship. That’s what Tulsa felt like, and that’s kind of what Fresno feels like even though it’s a bigger city. Tumey’s father, James, worked at the Tulsa Tribune, literally printing the paper. His mother, Shirley, worked as a machinist. GV Wire: How did your parents influence you in academics and athletics? Tumey: I’m a first-generation student-athlete. I was a first-generation student. My mom and dad both instilled in me very quickly the positive attributes of getting your education and why that was so important. The thing that they instilled in me is the fact that having your education allows you to take advantage of opportunities that are going to be presented in your life. I ran with that, and I still believe in that today. I’ve always had strong women in my life, and my mom definitely epitomizes that strength and determination that we have in our family. That’s her. GV Wire: As a football player, why did you choose UCLA over the University of Oklahoma? Tumey: I was a student-athlete and I was looking for a place that would allow me to grow not only on the field of play but academically as well. I wanted to try to find something that was really going to serve my needs as a person and as a student. UCLA was the perfect fit for me for that because it had so many opportunities that allow you to expand and explore. I was recruited by the University of Oklahoma. I thought Oklahoma was an amazing institution. Academically though, at that point in time, it didn’t offer the robust curriculum it does today. UCLA did so, therefore, it was an easy choice for me to not be a Sooner and to be a Bruin … and closer to the beach! have have a grandson who just graduated high school here in the mountain…awesome baseball player , the coaches here abused him in having him stay in the game when hurt..he is also a great soccer player…but being in a poor family he has no chance to continue on to college. any programs available or baseball scholar ships for this young man.